Jeff Repoz practiced hitting with his father in the family's garage. His father also gave him highlighted the importance of Ted Williams' book "The Science of Hitting," The Los Angeles Times wrote in 1986. Repoz' father, The Times wrote, was former longtime major leaguer Roger Repoz. "It's been an advantage for me because he helps me out," the younger Repoz told The Times that April, "and he knows what he's talking about." Repoz' father made the majors over nine seasons, playing with the Yankees, Angels and others. The younger Repoz turned pro himself, but had a much shorter career. Jeff Repoz played over two seasons, getting six total appearances. 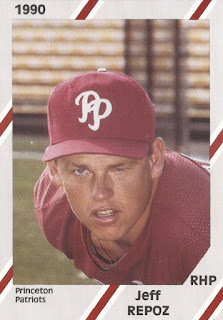 Jeff Repoz' career began in 1989, signed by the Phillies as an undrafted free agent out of Golden West College in California. Repoz played his high school ball at Katella High in Anaheim. He singled and scored in a March 1986 game. He then knocked in two runs on a triple a year later in a March 1987 contest. In college for Golden West, Repoz hit a two-run home run in a May 1989 game. Repoz started with the Phillies at short-season Batavia in 1989. He got into two games in relief. He gave up three earned in 2.2 innings of work. Assigned to rookie Princeton for 1990, Repoz started four games. He went 2-0, with a 3.54 ERA. Those four starts, however, marked the end of his career.